Our premier products are the mixers and mills that make baking homemade bread and pastries easy, while giving you the best and most consistent results. 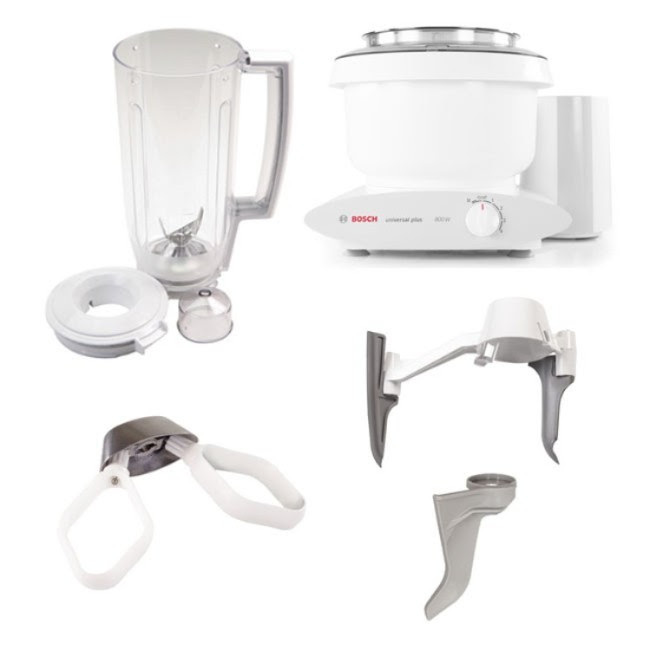 We feature the Bosch Universal Mixer and it’s accessories along with the Nutrimill Grain Mill. We want to take a moment to remind our customers that Bosch and Nutrimill have some great holiday bundles available for purchase. If you’ve been waiting to buy a Bosch Universal Mixer or a Nutrimill grain mill, this may be the time!! These deals continue until December 25, 2018. Bethlehem Harvest is proud to offer our customers special fall affiliate pricing for Bosch and Nutrimill products. The specials below are offered until December 25th. Using the coupon codes below, these prices, available via our affiliate links, are the best prices on the internet for these great products. MAKE SURE YOU USE THE COUPON CODES that accompany each deal!! A Bottom drive transmission with a removable drive shaft for easy cleaning. Dual beaters that can whip as little as one egg white or mash up to 10 pounds of cooked potatoes. Heavy duty dough hooks that are able to knead more than six loaves of whole grain bread dough in a single batch. Additional 1 Year Extended Warranty (total 4 Year Warranty)! 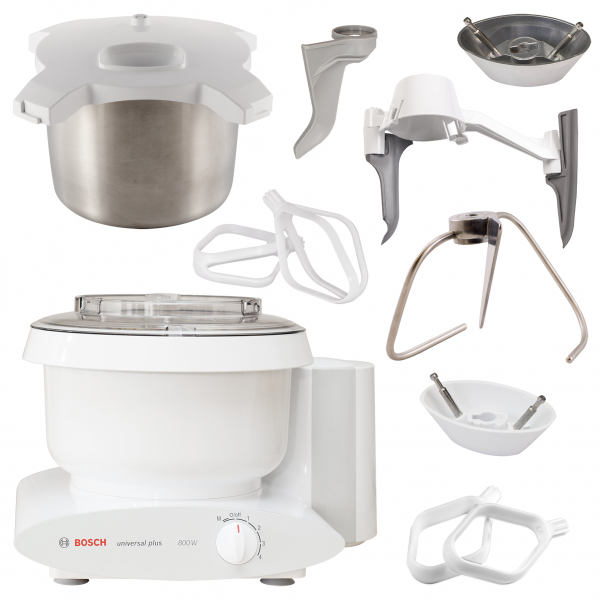 Save $196.00 using our affiliate link at boschmixer.com and this coupon code: HOLIDAYBOSCH. Your final price, including shipping, is $419.00! This package is perfect for those who want to mill fresh flour, coffee and spices every day! The Harvest mill quickly mills all non-oily grains and legumes in a wide range of textures from course to fine. The Mini Seed Mill will handle coffee, spices and flax seed in a flash! Carefully designed and crafted to be both practical and beautiful, the Harvest Mill is perfect for daily household milling tasks. The Fall Special pricing includes all of these items for $244 including shipping! To make it even easier for you to make an informed decision, we would like to invite you to come see these products at work. Schedule a product demonstration by calling/texting 281-797-8932 or send us an e-mail at bethlehemharvest@gmail.com. Bethlehem Harvest only promotes products that we use and enjoy ourselves, and we want you to be just as pleased with your purchase of these products as we have been with ours! To schedule a product demonstration please e-mail us at bethlehemharvest@gmail.com or call/text us at 281-797-8932. 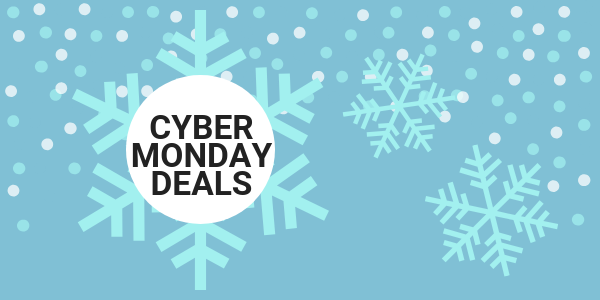 Bethlehem Harvest is excited to off you these Cyber Monday specials from Bosch and Nutrimill! 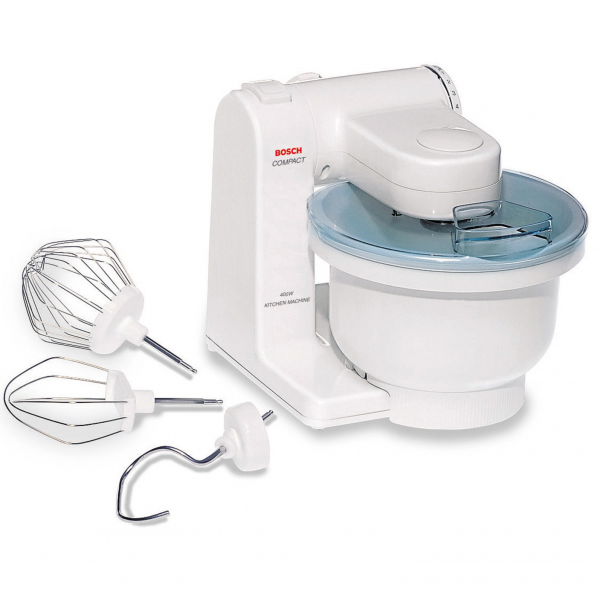 The Bosch Universal Mixer comes standard with heavy duty dough hooks and wire whips. Price includes shipping right to your front door! This deal includes everything a baker needs! 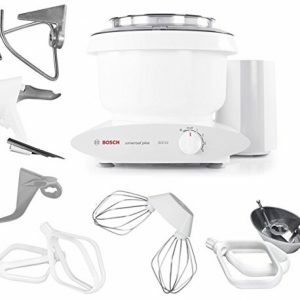 In addition to Bosch’s heavy duty dough hooks and standard wire whips, this package includes cake paddles for light batter, cookie paddles for heavy batters, a metal whip driver and a bowl scraper that keeps ingredients in the mixing area. Price includes shipping! 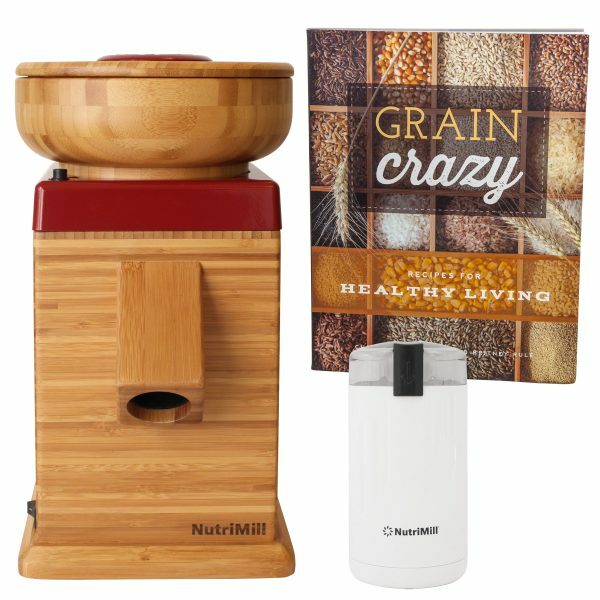 The Nutrimill Classic Grain Mill is my favorite grain mill! It is easy to use, easy to clean, and it quickly dry grains and legumes of all sorts. Regularly priced at $219, for only two days you can put this wonderful grain mill to work in your kitchen for $159! This great price even includes shipping! The Harvest Mill is also a favorite at our house. This mill is perfect for quickly milling smaller quantities of grain for use in your favorite recipes. It is equipped with near diamond hard Corundum Grainmaster milling stones. 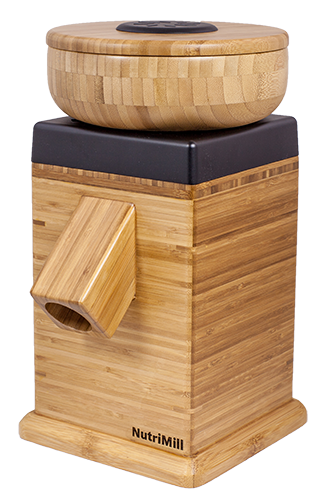 Beautiful and efficient, the Harvest Mill is a great addition to your kitchen. Regularly priced at $259, for two days only, it is available for $229, including shipping! The Artiste Mixer is the newest addition to the Nutrimill product line. A powerful mixer designed to meet the needs of every family. It’s lightweight, but has a high efficiency, 650-watt bottom-drive motor that can mix up to 10 pounds of whole grain dough. The Artiste comes in a variety of attractive colors to match your kitchen décor. This sale package comes with both cake paddles and an ice cream maker so you are ready to create some really special treats! Regularly priced at $308, for two days only you an purchase the Artiste Cake and Ice Cream Bundle for $149 – a really great deal! Wishing you happy Cyber Monday shopping and a wonderful holiday season! Fall Specials from Bosch and Nutrimill! 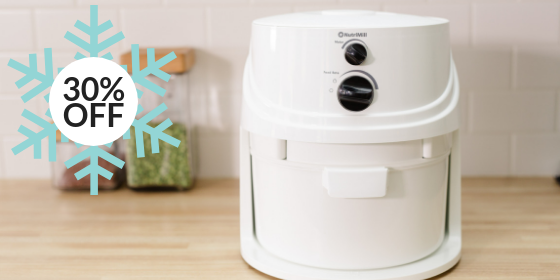 These Fall Specials from Bosch and Nutrmill continue until December 25th, but here’s a “HEADS UP!” There are some great deals coming your way for Cyber Monday. We will be sending out an e-mail after Thanksgiving with the details of those opportunities. If you’ve been waiting to buy a Bosch Universal Mixer or a Nutrimill grain mill, this may be the time!! Bethlehem Harvest is proud to offer our customers special fall affiliate pricing for Bosch and Nutrimill products. The specials below are offered for a limited time, but there is no need to make a rushed decision. Using the coupon codes below, these prices are available via our affiliate links from now until December 25th, 2018. 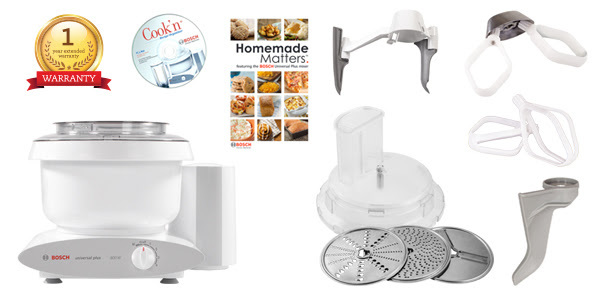 Bosch and Nutrimill Fall Specials! If you have been contemplating the purchase of a Bosch Universal Plus Mixer, we have a deal that you will NOT want to miss!! 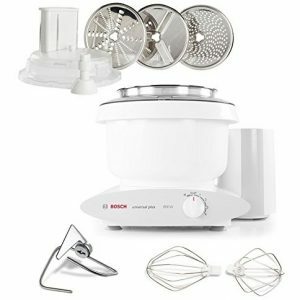 This package is currently listed on the boschmixer.com web site for $525.00, but using our affiliate link: Bosch Back to School Bundle and the discount code, BACK2SCHOOL at check out, Bethlehem Harvest customers can save an additional $115, giving you a final price of $410 for the entire package shipped to your door! This is an exceptionally good deal for the Bosch Mixer and the Blender, which just happens to be one of my favorite attachments. Just use our affiliate link:Bosch Back to School Bundle and at check out use the code: BACK2SCHOOL to secure this great deal. The Harvest Grain Mill by Nutrimill is being offered for the special price of $229.00. It is available in so many beautiful colors to complement your kitchen. I love having this stone mill sitting on my counter, ready to go at a moment’s notice! To learn more, check out our affiliate link: NutriMill Grain Mills or give us a call at 281-797-8932. We would be happy to demonstrate this mill for you! 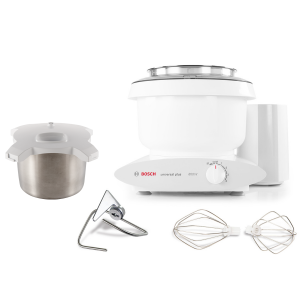 If you have limited counter space and a smaller family, you might be interested in the affordable Bosch Compact Mixer. It is a small, but still mighty, version of the famous Bosch Universal. If you have questions about any of these products, or if you would like to see any of these items demonstrated live, just drop us a note at bethlehemharvest@gmail.com or give us a call or text us at 281-797-8932. We would be delighted to assist you! Protect your grains! This package is perfect for those who do frequent high volume milling. The NutriMill Classic keeps your flour at temperatures that protect the nutrients in your grains. This mill has improved texture control, stronger milling heads, sound reducing noise chamber, improved motor cooling, and longer life. With the compact storing of the mill, it is easy to stow away when you’re not using! 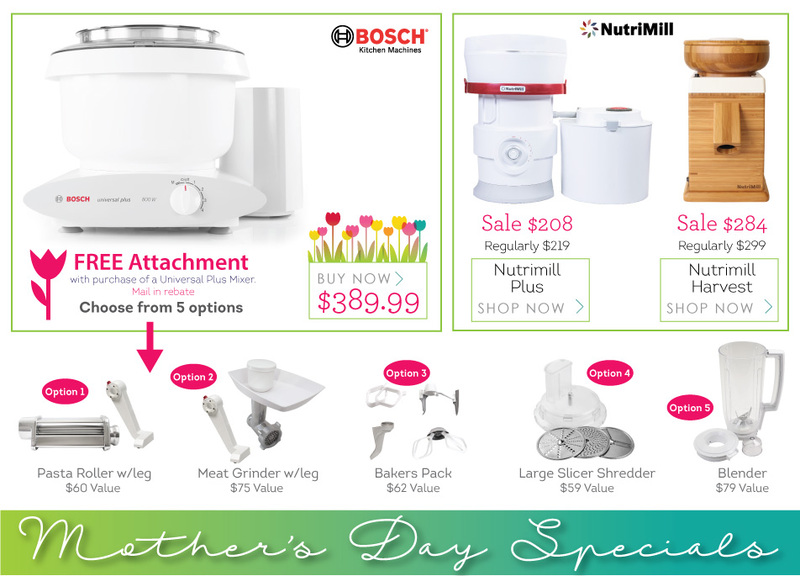 Bosch and Nutrimill Mother’s Day Specials!! This year is no different. We are excited to make the following Bosch Mixer and Nutrimill Grain Mill specials available to our customers. If you have been wanting to invest in a high quality mixer suitable for kneading whole grain bread dough or if you have been wanting to purchase a mill so you can make your own freshly milled flours at home – this is a great opportunity!! 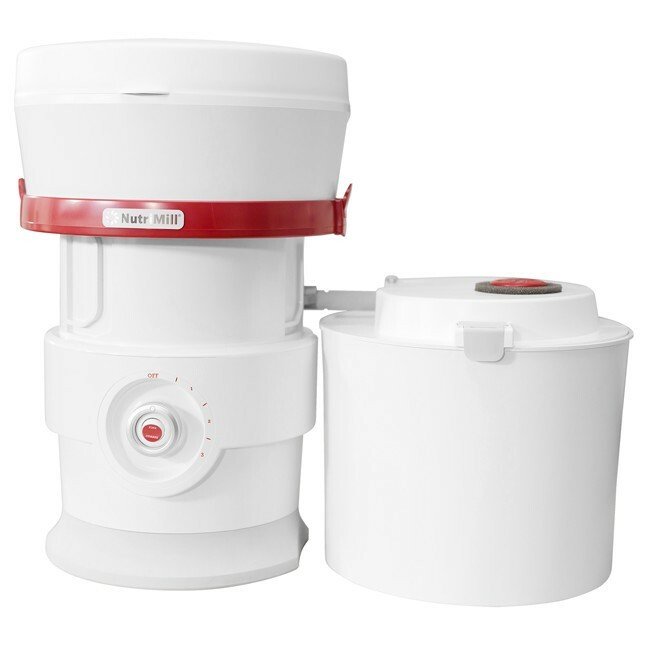 There are four different Universal Plus Mixer Mother’s Day Bundles and two opportunities to purchase Nutrimill Grain Mills at discounted prices. Each of these specials can be purchased directly from Gail DeGray at Bethlehem Harvest or through our affiliate link at boschmixer.com. Either way shipping is free! 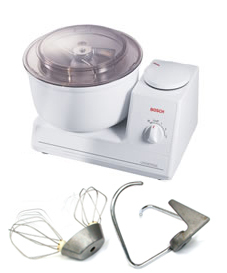 Bosch Special #1 For those who love to bake! Universal Plus Mixer with the Baker’s Pack (Bowl Scraper, Metal Whip Drive, Cookie Paddles and Cake Paddles. Bosch Special #2 Perfect for the gardener with produce galore! Universal Plus Mixer and the Large Slicer Shredder. Or have it all! Purchase the Bosch Universal Plus Mixer with BOTH the Large Slicer Shredder AND the Baker’s Pack for $439.00! Bosch Special #3 For Ice Cream Lovers Everywhere! Bosch Universal Mixer and the wonderful new Ice Cream Maker! Turn your Bosch into a party! The Nutrimill Plus Grain Mill uses micro-impact milling heads to offer a quick and quiet grain milling of non-oily grains and legumes. Its large capacity bucket holds up to 24 cups of freshly milled flour in a wide range of textures. It comes with a flour bagger attachment. The Harvest Mill is a beautiful and versatile mill. Its Corundum Grainmaster milling stones mill non-oily grains into a full range of textures from cracked grain for hot cereal to pastry fine flour for baked goods. A very handy tool for any serious baker! These prices are in effect until May 13, 2018. L’Chef reserves the right to limit quantities. 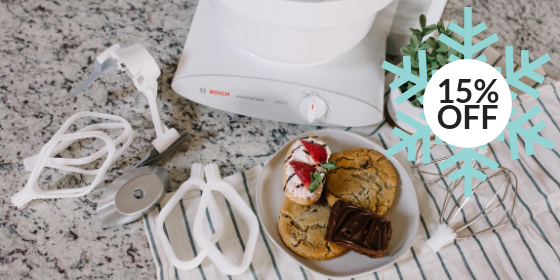 Purchase a new Bosch Universal Plus Mixer for the special price of $389.99 and pick from one of five great attachments as a FREE mail in rebate! Nothing quite like having new tools for your kitchen! Personally, I can hardly wait to try out my new pasta making tools!! Buy a Bosch and pick one of the FREE attachments! Customers from the Houston metro area who purchase a Bosch Universal Mixer through Bethlehem Harvest’s affiliate link at boschmixer.com will receive a FREE BREAD BAKING CLASS! Just drop us an e-mail at bethlehemharvest@gmail.com to verify your purchase and sign up for a class! The Nutrimill Plus Grain Mill is the latest mill in the Nutrimill family, and is ON SALE for $208.99. 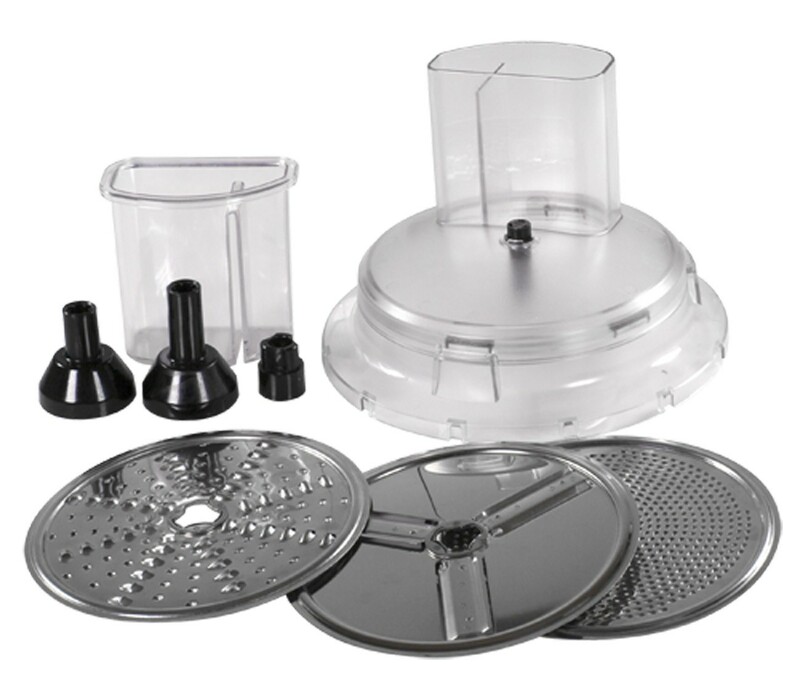 The Nutrimill Plus is a workhorse that utilizes stainless steel micro-impact milling heads, and offers a 16 cup hopper capacity and 24 cup flour bowl capacity. The collapsible hopper nests in the flour bowl for neat and compact storage. The beautiful and versatile Nutrimill Harvest Grain Mill is available for the SPECIAL PRICE of $284.99. It quickly mills all non-oily grains and legumes with its Corundum Grainmaster milling stones. It offers a full range of textures from cracked grain to fine pastry flour for baked goods. 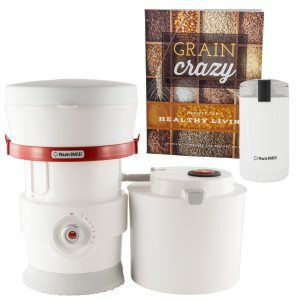 Customers from the Houston metro area who purchase a Nutrimill grain mill through Bethlehem Harvest’s affiliate link at boschmixer.com will receive a FREE FIVE POUND BAG OF PRAIRIE GOLD WHEAT to get you started milling! Just drop us an e-mail at bethlehemharvest@gmail.com to verify your purchase and order your wheat! If you have any questions, please feel free to drop us an e-mail at bethlehemharvest@gmail.com or give us a call at 281-797-8932. Happy Mother’s Day and Happy Baking! Nutrimill Classic Mill + Free Seed Mill = Great Deal! Are you interested in a reliable grain mill that will meet all of your families needs? If so, you can’t beat the Nutrimill Classic Grain mill with its high speed impact chamber that creates flour from grains and beans. The Nutrimill allows you to grind up to 20 cups of flour at one time with no gumming, overheating, or jamming. Nutrimill is versatile, convenient, powerful and fast. It is one of the quietest impact mills on the market today. Definitely an important addition to any bread maker’s kitchen. 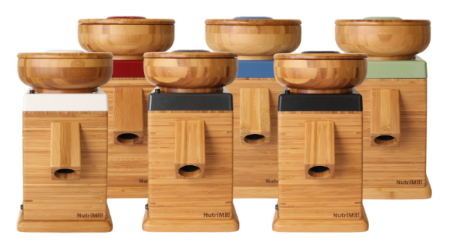 Nutrimill is offering its Classic Grain Mill at the regular price of $219.99, but they are throwing in their wonderful “Mini Mill” that will neatly mill items not suitable for the grain mill: flax seed, spices, herbs and so much more. The Mini Seed Mill retails for $24.99, but is worth its weight in gold – such a handy gadget for your kitchen! To order your Nutrimill Classic with your free Mini Seed Mill contact Gail DeGray at 281-797-8932 or e-mail us at bethlehemharvest@gmail.com. 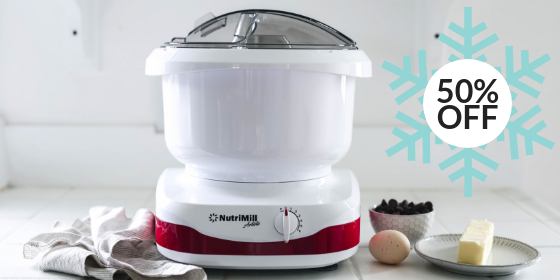 This Nutrimill Classic + Free Mini Seed Mill offer is good through December 31, 2016. During the rest of the month of August, Bosch is offering two special deals on a great accessory for the Bosch Universal Plus Mixer! 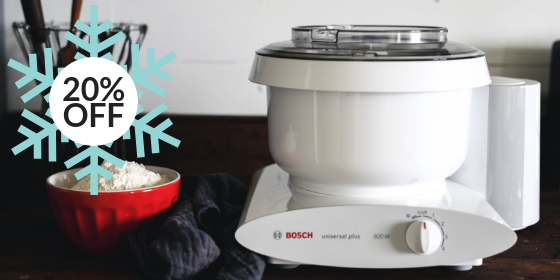 The Large Slicer/Shredder fits right on top of the Bosch bowl so you can slice and shred right into the bowl, providing a huge 6.5 quart batch capacity. The Large Slicer/Shredder processes foods with top-mounted disks which are fed down a chute. It includes three disks: Shredding/Grating (reversible for coarse & fine), Slicing (reversible for thick & thin), and Fine Grating. Additional disks are also available. 2) If you already own a Bosch Universal Plus and want to add this accessory, you can purchase the Large Slicer Shredder for $64.99. Bethlehem Harvest is excited to offer the Nutrimill Harvest Grain Mill at the unheard of price of $184.70 – a savings of over $215!! But head’s up – this is a two day FLASH SALE – only July 24th and 25th. The Harvest Mill is efficient, convenient and attractive – what a great combination! If you’ve been thinking about purchasing this beauty, now is your chance!! 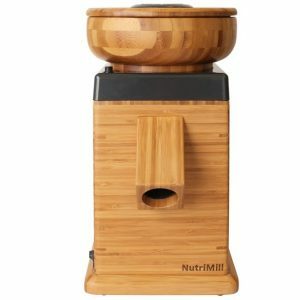 Nutrimill Harvest Flash Sale Pricing! This Nutrimill Harvest FLASH SALE celebrates Utah’s Statehood (also known as Pioneer day). Since the Nutrimill Harvest is designed and assembled in Utah, the mill is priced at $184.70, reflecting the year 1847, when the Pioneers settled the Salt Lake Valley. Regularly priced at $399.99, this is a bargain you won’t see again soon! Grab the link below and pick up one of these wonderful stone mills while you can. Nutrimill Harvest Flash Sale Pricing! 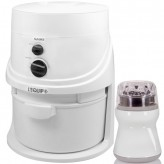 The NutriMill Harvest allows you to grind your own fresh, nutritious whole grain flour. The adjustable knob and corundum millstones allow you to grind fine pastry flour, cracked grains for cereal and everything in between. Convenient, beautiful, and now affordable too. Jump while you can!! Give us a call if you have any questions or if you want a quick demo. If you order through our link, please let us know so that we can make sure your order is processed properly. Nutrimill Harvest Flash Sale Pricing!! When the link opens, click on the “Nutrimill” label at the top to navigate to the Flash Sale pricing. Shipping is included! !